River was my rainbow puppy.....rainbow being the colour of ric-rac around his neck as a newborn. I would spend hours hanging over the whelping box, running my fingers along this puppy. By the time River was a few days old, there was clearly something very special about him. River stayed at home until almost 5 months. But I was already keeping his sister Twist, and am very reluctant to raise 2 pups together as they tend to bond to each other too strongly. The perfect solution presented itself when my good friends, Mark and Alison Ward, asked if I would let River go live with them. 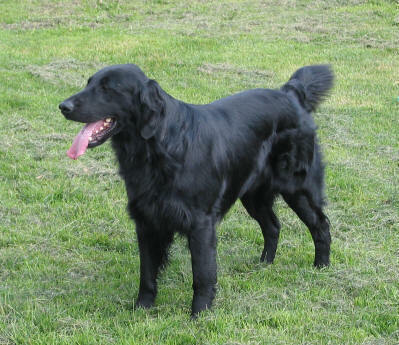 Mark and Alison already owned another Flatcoat and lived about 10 minutes away. Today, the 3 of us co-own River together. 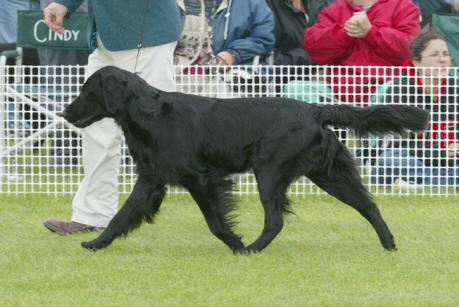 River finished his championship with ease, often winning over older dogs. Along the way, he also won a Best Puppy in Group award. 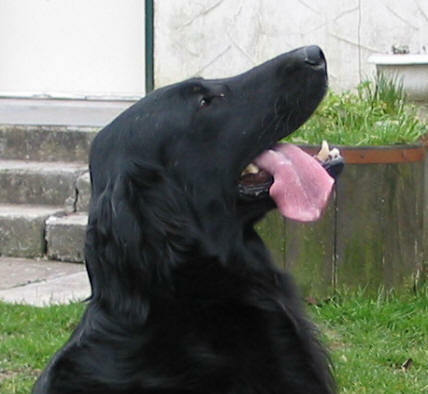 He came with me to the American Flat-Coated Retriever National Specialty in Colorado in 2001 where he placed 3rd in his Sweepstakes Class and 2nd in his class in the Specialty. 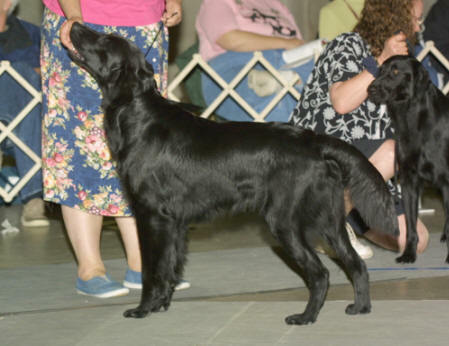 A few months later, he came to Nova Scotia for the Canadian National Specialty where he won Best in Sweeps and placed 2nd in his class in the Specialty. That was only the beginning as River went on to finish his US championship in 2 consecutive weekends, winning 4 majors. In 3 consecutive National Specialties (2002, 2003, 2004), River made the final cut for BOB including winning a JAM in 2003. In 2006, after 3 years away from the show ring, River attended the Specialty in Quebec City, and as Veteran, he again won a JAM. 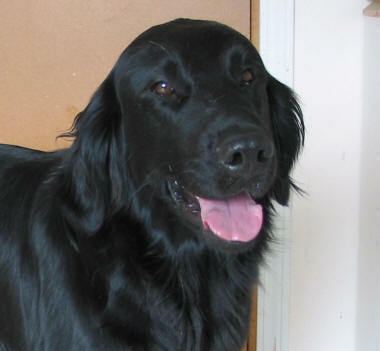 River is an avid retriever and a dynamite swimmer. Although ready to run in working tests, time and opportunity in his family has prevented his participation thus far. At home, River is an unrepentant shoe thief, but doesn't do any damage......he just carries them into the back garden to tease his family into playing hide and seek. A sweeter and more loving dog would be hard to find.